A man chosen by the gods will unite us…. whatever, What looks like it might have had a chance at being a cool movie this teaser trailer looks strangely unfinished in parts. 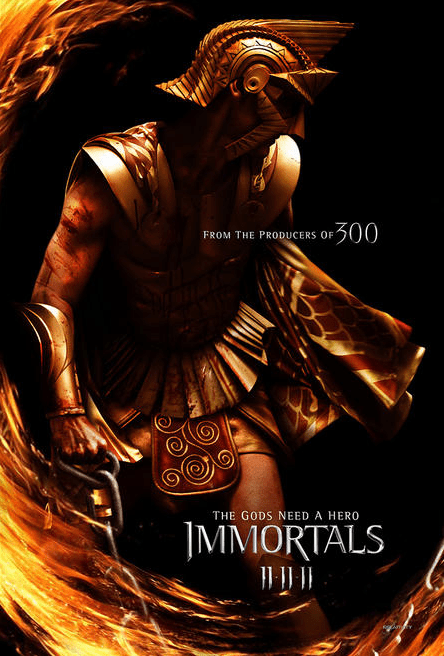 It’s from the producers of 300 and is due out 11-11-11 so there is plenty of time to clean it up so we are going to give it the benefit of the doubt for now. Plot: The brutal and bloodthirsty King Hyperion and his murderous Heraklion army are rampaging across Greece in search of the long lost Bow of Epirus. With the invincible Bow, the king will be able to overthrow the Gods of Olympus and become the undisputed master of his world. With ruthless efficiency, Hyperion and his legions destroy everything in their wake, and it seems nothing will stop the evil king’s mission. As village after village is obliterated, a stonemason named Theseus vows to avenge the death of his mother in one of Hyperion’s raids. When Theseus meets the Sybelline Oracle, Phaedra, her disturbing visions of the young man’s future convince her that he is the key to stopping the destruction. With her help, Theseus assembles a small band of followers and embraces his destiny in a final desperate battle for the future of humanity.